The Israeli spacecraft - called Beresheet - attempted a soft touchdown, but suffered technical problems on its descent to the lunar surface. Only government space agencies from the former Soviet Union, the US and China have achieved soft lunar landings. Israel hoped to become the fourth country to do this. "I think that the achievement of getting to where we got is really tremendous; I think we can be proud," he said. After a seven-week journey to the Moon, the robotic spacecraft approached a final orbit at 15km (9 miles) from the surface. Tensions were high in the command centre as communications were lost before Opher Doron, the general manager of Israel Aerospace Industries' space division, announced there had been a failure in the spacecraft. "We unfortunately have not managed to land successfully," he said. Dr Kimberly Cartier, an astronomer and science news reporter, tweeted that she was "sad about how #Beresheet ended" but "proud of the entire @TeamSpaceIL". Beresheet, which is Hebrew for "in the beginning", was a joint project between SpaceIL, a privately funded Israeli non-profit organisation, and Israel Aerospace Industries. The average distance to the Moon is 380,000km (240,000 miles) - Beresheet travelled more than 15 times that distance. And the main thing driving this was cost. Sharing the ride into space significantly reduced its launch costs - but it meant the spacecraft had to take a more convoluted route. Its first job was to use its high-resolution cameras to take some photos - including a selfie - which it did manage before the crash. Monica Grady, professor of planetary and space science at Open University, said it would be "looking at the landing site really closely". This would help "work out how the magnetic measurements of the Moon fit in with the geology and geography of the Moon, which is really important to understand how the Moon formed". Over 60 years of space exploration, only a few nations have made it down on to the Moon. The former Soviet Union achieved the first soft landing with its spacecraft Luna 9 in 1966. Nasa followed this by getting the first humans to the Moon in 1969. 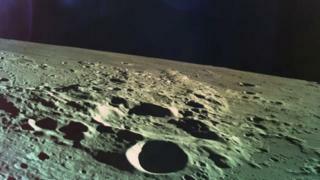 In 2008, India's space agency fired an impact probe, which intentionally crashed into the Moon's south pole. Then, China's Change-4 spacecraft touched down on the farside of the Moon earlier this year. If their landing had worked, Israel would have been the latest nation to join this elite club. But it was the low-price tag - and the fact that the mission was not funded by a major space agency - that was significant.